Since developing and releasing the first ever auto-darkening welding helmet in 1981, Speedglas has been at the forefront of welding helmet technology and design. Let’s take a look at the four design factors that drive Speedglas Welding Helmet technology. Reliability is a key factor driving the design of 3M Speedglas Welding Helmets. Welders need a welding mask that they can rely on to protect them against a range of hazards. A dependable auto-darkening lens with a lightning quick light-to-dark switching speed as well as effective Ultraviolet (UV) and Infrared (IR) protection is essential in protecting your eyes before, during and after an arc is struck. The new Auto-On feature in the Speedglas 9100XXi auto-darkening welding lens takes this one step further, with the helmet automatically turning on as soon as you pick it up. This means the auto-darkening filter is ready to go when you are! Welding can be a tough and tiring job at the best of times, so it’s important to be as comfortable as possible to help minimise fatigue and maximise productivity. Given that a welding helmet sits on your head all day, a comfortable head harness is essential. Speedglas head harnesses are fully adjustable for a custom fit. The Speedglas 9100 series harness is specifically designed to avoid sensitive ‘pressure points’ around the head and features two adjustable crown straps to more evenly distribute weight for greater balance. For those welding with powered air protection against carcinogenic welding fume, the belt-mounted Adflo Powered Air Respirator (PAPR) is comfortable and lightweight. The Adflo PAPR connects to the Speedglas respiratory welding helmets and provides a constant flow of fresh, clean air helping to keep you cool and comfortable as you weld. Welders face a number of hazards in the workplace and no two welders are the same…meaning a customisable approach to welding protection is needed. While all Speedglas welding helmets offer high impact eye and face protection, the Speedglas 9100 series helmets are available in a range of configurations including safety helmets for head protection, optional hearing protection and of course welding powered air respirators. When you weld with Speedglas, you can rest assured you’re getting the best protection available. It has often been said that the view from within a Speedglas helmet needs to be seen to be believed… And we tend to agree! 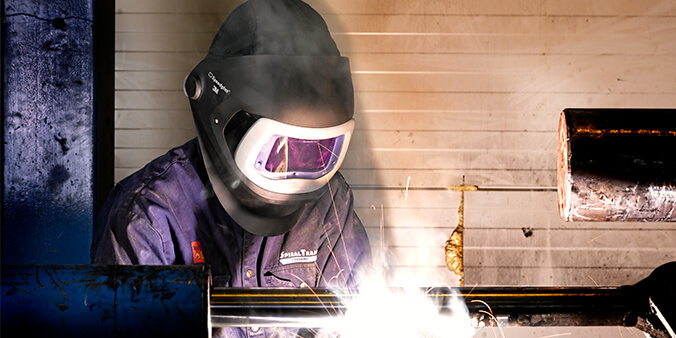 Major factors when designing Speedglas welding helmets include optical clarity, viewing area and the ability to see MORE of your work environment. True-View welding lens optics in the Speedglas 9100XXi Series and Speedglas 9002NC enhance your view by allowing for a clearer and more consistent view of the weld pool. Greater clarity and improved contrast allow for greater control and accuracy when placing electrodes. Viewing area is a major design consideration. Not only does the Speedglas 9100XXi series offer True-View technology and an extra-large 73x107mm viewing area, it also boasts two peripheral shade 5 SideWindows which allow you to see what is happening around you. If you frequently grind, the Speedglas 9100 FX Air and Speedglas 9100 MP helmets both feature a smooth flip-up function which reveals a curved grinding visor with large 170° views.